2018 Video and Photo Contest Winners! 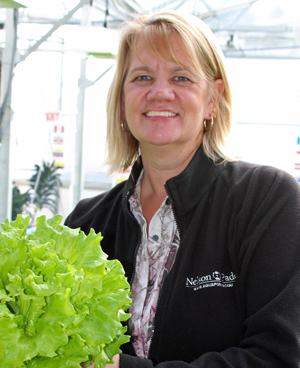 Rebecca Nelson is co-founder and co-owner of Nelson and Pade, Inc.®, the global leader in aquaponic systems and training, and she is an adjunct instructor for the University of Wisconsin-Stevens Point. Rebecca is the author of the first and primary book on aquaponics, Aquaponic Food Production, and is the editor of the Aquaponics Journal®, published continuously from 1997-2013. Rebecca writes the curriculums for and teaches in Nelson and Pade, Inc.®’s Aquaponics Master Classes® and guides the company’s media and advertising efforts. Rebecca is a featured authority on local and national radio, TV, magazine and newspaper coverage of aquaponics. Most recently, she appeared on TV in both Madison, WI and Belize, Central America and she was quoted in Delta Airlines Sky Magazine in a feature on aquaponics. 2015 Invited to join the NZ4 Global Alliance, an organization dedicated to sustainability for the future.